Starting Saturday, May 23, 2009, Ferry Plaza Farmers Market vendors will only dispense bags that are fully compostable or recyclable within the City of San Francisco waste collection program, such as compostable BioBags® and paper bags. Plastic bags do not meet these standards and will no longer be available at the market. Will there be a charge for the new bags? BioBags and some paper bags cost significantly more than cheap, fossil fuel-derived plastic bags. This new CUESA policy allows each market seller to decide how to best recover their costs from customers (using incentives, surcharges, etc.). We believe that shoppers, not farmers and food producers, should bear the financial burden for the bags they use. 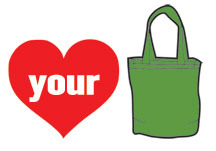 You can help support your farmers by bringing your own bags. In a sustainable food system, it’s not only the food that’s important, but also how it is packaged and carried home. Plastic bags are one of the most ubiquitous products in the world, and over a million of them leave the Ferry Plaza Farmers Market each year. Only 1 to 4% of bags in the US are recycled. There are negative consequences of plastic bags at every step in their life cycle, such as the extraction of the petroleum and natural gas used in their production, the energy consumed and pollution generated in the manufacturing process, and the fact that most of them end up in the landfill. What are the compostable bags made of? Do they contain genetically modified organisms (GMOs)? BioBags are made in San Leandro out of Mater-Bi™, a resin manufactured in Italy out of starches, glycerines, and other materials that come from corn (it may also contain some canola- and sunflower-derived products). Mater-Bi is certified GMO-free by a European third party certifier. Mater-Bi is currently not manufactured in the United States because GMO-free corn is not available here. Are BioBags really better than plastic? Single-use disposable items are never going to be truly sustainable. 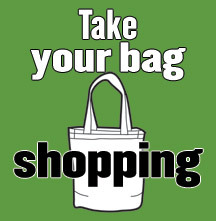 The greenest solution is to reduce bag consumption and reuse the bags you have. But everyone forgets their bag from time to time, and we want to provide the most environmentally friendly alternative available. BioBags and paper bags are a stopgap solution until we’ve all trained ourselves to bring our own reusable bags to the market every time we shop. CUESA’s Board of Directors (which includes 3 market sellers) proposed the idea, then solicited feedback from all market sellers on their preferred implementation strategies. Is the FPFM the only market making the switch away from plastic bags? We’re early to the game, but we can’t say we’re the first. The Berkeley Farmers Market is doing away with plastic bags this spring; the Old Monterey Market in Monterey, CA stopped distributing them last Earth Day. The Irvine market in Southern California is also bag free, and there are several other markets in the area trying the idea on for size, including the Fairfax market in Marin.